A total of 27 prosecution witnesses including star witness, Mohd Saiful, and eight defence witnesses including Anwar testified in the trial that took almost three years at the High Court which received attraction worldwide. PUTRAJAYA: The Federal Court is scheduled to deliver its verdict on the final appeal of PKR advisor Datuk Seri Anwar Ibrahim to set aside his five-year jail sentence forsodomisinghis former aide Mohd Saiful Bukhari Azlan, this morning. Chief Justice Tun Arifin Zakaria, who is leading a five-member panel comprising Court of Appeal president Tan Sri Md Raus Shariff and Federal Court judges Tan Sri Abdull Hamid Embong, Tan Sri Suriyadi Halim Omar and Datuk Ramly Ali, expected to pronounce the ruling at 9am. The highest court in the country will make its ruling on whether to allow or dismissAnwar's appealto set aside his conviction and jail sentence imposed by the Court of Appeal on March 7 last year, after it had overturned a High Court decision to acquit him. 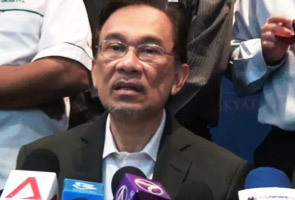 If Anwar loses his appeal, he will be disqualified as the member of parliament (MP) for Permatang Pauh as per Article 48(1)(e) of the Federal Constitution, which states that an MP would be disqualified if he or she is sentenced to a jail term of more than a year, or fined more than RM2,000. The prosecution has also filed a cross-appeal to enhance the jail sentence. However, the matter will only be heard if the Federal Court upholds the decision of the Court of Appeal. Anwar is represented by a team of 15 lawyers led by Datuk Seri Gopal Sri Ram, a former Federal Court judge himself. The other 14 lawyers are Ramkarpal Singh Deo, Gobind Singh Deo, Sangeet Kaur Deo, N.Surendran, R.Sivarasa, J.Leela, Latheefa Koya, Lim Choon Khim, Eric Paulsen, Michelle Yesudas, Shahid Adli Kamaruddin, Zaleha Al-Hayat, Jeremy Vinesh Anthony and Mohamed Aliff Bolkin. A senior lawyer, Tan Sri Muhammad Shafee Abdullah, is leading the prosecution team in the appeal. He is assisted by deputy public prosecutor Datuk Mohamad Hanafiah Zakaria. The Court of Appeal had found Anwar, 67, guilty of havingsodomisedMohd Saiful, 30, at Unit 11-5-1 ofDesa Damansara Condominiumin Jalan Setiakasih, Bukit Damansara, here, between 3.10pm and 4.30pm on June 26, 2008. The charge, under Section 377B of the Penal Code, carries a jail sentence of up to 20 years and whipping, upon conviction. A total of 27 prosecutionwitnesses includingstar witness, Mohd Saiful, and eightdefencewitnesses includingAnwar testified in the trial that took almost three years at the High Court which received attraction worldwide. On Jan 9, 2012, the High Court acquitted and discharged Anwar of the charge on the grounds that the court could not be 100 per cent certainonthe integrity of samples taken for DNA testing from the alleged victim. The court had ruled that the samples could have been compromised before they reached the chemistry department for analysis. However, the Court of Appeal had overturned the High Court judgment and found Anwar guilty ofsodomisingMohd Saiful and held that the trial judge had erred in his findings about the samples which were based on the evidence of two expert witnesses called by thedefence.